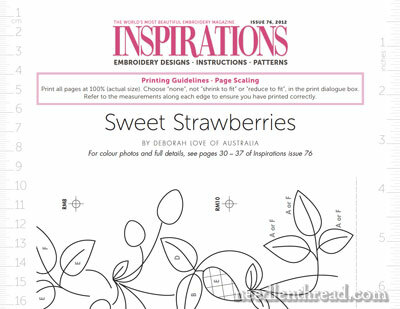 Did you know that the most beautiful embroidery magazine in the world – Inspirations Magazine – is now available in electronic format? This means the magazine can be read on a computer, laptop, mobile device (iPad, iPod, iPhone, Android), or electronic reader (kindle, nook, etc.). It also means that, if you found the print price of the magazine out of your budget range, you can now get the electronic version for less than half price for the year. For less than $40 per year (four issues), you can enjoy Inspirations Magazine in electronic format. It also means that you don’t actually have to wait for your subscription to arrive in the mail. But… but…. well. More on that point, later. At first, I was a little skeptical, I admit. I’m not exactly an “e-reader,” myself. I admit that I’ve never read a book on my iPad! I like books that you open with your hands, so you can feeeeeeeel the paper, books that you can smell (yes, books have a smell!). And I like audiobooks, because they see me through many a long embroidery project. But I haven’t yet gotten into electronic books. But I do use my iPad a lot when traveling, and I do a lot of blog-related stuff on it. So I was eager to see just how Inspirations would translate, electronically. To that end, I bought a copy of the first electronic issue, and here’s how the purchase went, and my impressions of the new electronic version of Inspirations Magazine. First of all, going through Zinio (this is the platform which hosts Inspirations Magazine), you have two options. You can opt in for a full subscription, which is the most economical approach, or you can be an individual copy. I bought an individual copy, since I am already subscribed to the paper version of the magazine. 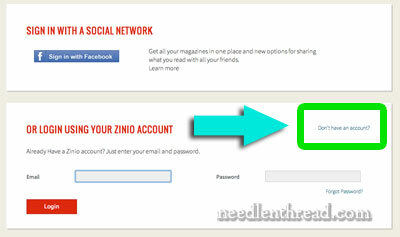 To make the purchase, you have to have a zinio account. They give you a couple options for sign in, and you’ll find a link to “Don’t have an account?” on the right hand side of the page. Click that link and set up an account, if you don’t already have one. It takes all of 45 seconds, depending on how fast you type. Once you have an account set up, you make your purchase. You can pay via credit card or via Paypal. Just be sure that you understand the payment set up, if you subscribe to the magazine. The subscription auto-renews. You can cancel at any time, and they will refund you the issues in the subscription that haven’t arrived yet, but you should be aware that the subscription does auto-renew. 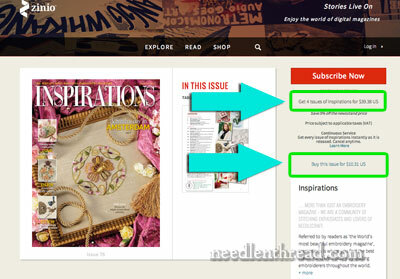 Once you make your purchase, you will be prompted to download the reader for zinio. You have to have a separate app on your computer or device to read magazines through zinio. The download process for the app is very easy, but if you miss the prompt, you’ll have to do some digging to get to the app download. The easiest way I found to access it (besides googling “zinio reader 4 app download”) was to use the “help” feature at the bottom of the zinio page, under your reading list after making the purchase. In the Help screen, you’ll find information on the different ways you can read magazines through zinio. Click on your device (PC / Mac, iPad, Android…) and you’ll be taken to the FAQs for that device. There, find the question “Where do I download….” and you’ll be taken to the right place. I know this part sounds complicated, but it’s only because I missed the prompt to download the app. If you don’t miss that after you’ve made your purchase, you’ll save a step or two! In any case, within about 3 minutes of starting the whole process, I had the latest issue of Inspirations in front of me, on my desktop. 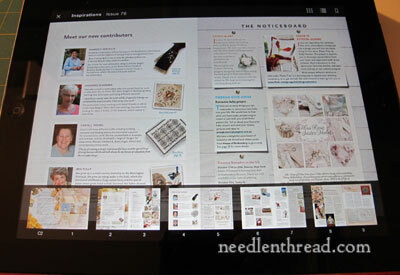 Zinio gives you all kinds of ways to access the different pages in the magazine. You can scroll through the full size pages, or you can click the thumbnail view and see the whole glorious magazine in little rectangles spread out before you. You can click on the page you want, and go right to it. Alternately, you can go straight to the table of contents, and each item in the table of contents is clickable, so you can move easily to whatever part of the magazine you want to access. But you know, in Inspirations Magazine proper, the pattern pages at the back of the magazine are a key feature. How is this handled electronically, I wondered? At the end of the table of contents, there’s a nifty little box titled Pattern Downloads! Click on the pattern you want, and you have a nice PDF with the line drawing, ready to print out! So you bought the electronic version of the magazine while you were sitting at your computer, right? (Well, that’s how I did it.) But what if you want to transport that copy around with you? Assuming you have some kind of the many devices that people use for these things, it’s easy – you just download the app for the appropriate device on your device. In my case, I use an iPad, so I downloaded the free zinio app from the app store, logged into my zinio account, and there was the magazine, waiting for me. The features of the iPad app are slightly different from the features I see on my Mac’s desktop, but the content is all the same. Instead of a full page thumbnail view, the thumbnails are available along the base of the iPad screen. You can click or pinch on any page and it will fill the screen or return to the thumbnail view. And you can easily swipe through the whole magazine page-by-page. The table of contents is clickable, so you can visit that page and click directly to whatever page you want to visit. But… on the iPad, what about those pattern pages? 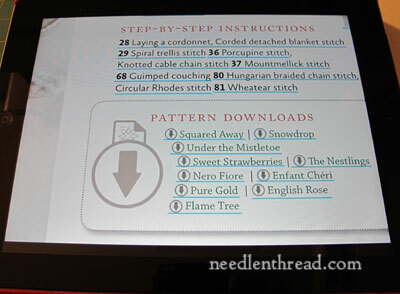 And when you click on the link for the pattern download, the pattern opens in a separate document, and you can “air print” that to your networked printer if you need to. Incidentally, on small patterns, you can also use your iPad as a light box, and just trace your design straight onto your fabric…. … or you can easily zoom in to view very clear, detailed photos or smaller chunks for reading. Pros – these are Easy! 1. You get to enjoy the content of Inspirations Magazine for less than half the price of a regular print subscription, if you subscribe for the whole year. 2. If you are an electronic-reader-sort-of-person, you’ve already got everything you need to bring Inspirations to your fingertips. 3. The magazine is beautiful in print; it is equally as beautiful, digitally! You can zoom in on the photos and see them up close – it’s just really nicely done! 4. It’s very easy to move around in the magazine, to access your favorite parts, to find what you’re looking for. 5. 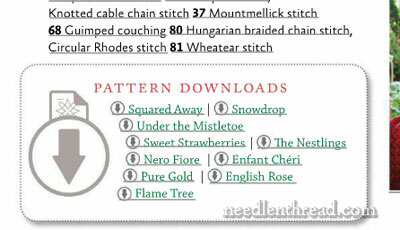 The pattern downloads are tres nice! 6. You don’t have to wait for your print copy to arrive! Once the magazine is out, it’s out. It’s available. You’ve got it. It’s at your fingertips. And zinio will let you know when it is there. 1. You don’t have a hard copy, obviously. 2. If you like reading real books, flipping real pages, toting a magazine around, and so forth (I do like these things, including toting a paper magazine around for something to read), then obviously, you will miss those experiences. So many magazines and newspapers have gone digital, that it’s no surprise that Inspirations has gone this route. As costs increase on printed materials and magazines, on shipping, and the like, the subscription prices become more and more expensive for printed magazines, especially high quality magazines like Inspirations. I’m glad that they are giving folks a more economical option for acquiring their magazines. Will the print magazine disappear in the future? I suppose that remains to be seen. But there are so many options with digital magazines now. Maybe, for example, hard-to-find back issues will become available for electronic purchase. That would be kind of nice! But I don’t know what the future holds in store. It’s a tricky situation, to be a publisher in this digital age and make enough money to keep a business afloat, that’s for sure. I’m glad that Inspirations is doing their darndest to spread the love of beautiful embroidery. It’ll be interesting to see where the future goes with this! In the meantime, if you are keen to read Inspirations in electronic format, you can find Inspirations Magazine available on zinio! On the one hand I like the idea of getting a magazine right away. Many cross stitch magazines that I love are from the UK and I have to wait a month or more before they arrive in the US. In the meantime my overseas friends are stitching away on the new patterns. All I can do is drool. On the other hand many of the same friends that have gone digital with their mags have had problems downloading the patterns. I don’t know what the problems are but they fuss and fume because they can’t get it to work. And like you Mary, I love having my magazines to browse on a cold winter evening or a hot summer day or any day for that matter. Nothing like grabbing a few and looking at all the beautiful pictures. Any idea how a person backs up the emagazines in case the ereader bites the dust? Electronic gear doesn’t last forever. Mary, thanks so much for letting us know about this new option. 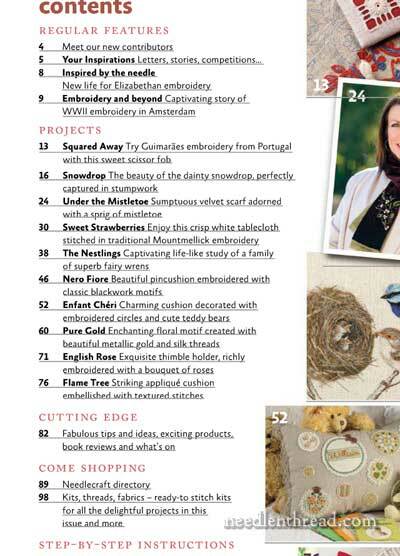 I love this publication but am primarily a cross stitcher. 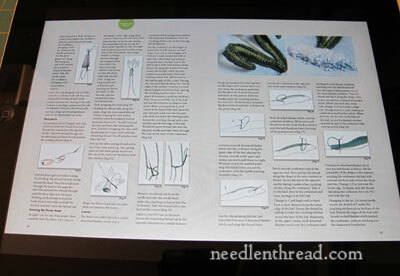 Reading your blog, which is on my daily ‘must do’ list, has me getting ready to create my own embroidery project. You make it look like a very achievable goal. Btw, I am eagerly awaiting your publication of the smalls. While I love hard copies, and ordered a subscription when you had your last contest about it, the reduced cost alone will have me switch over. the other, and this is not a pro mentioned above, is that I am running out of space to keep all my magazines, patterns and books even though I am fortunate that I have able to take over a spare room in the house. This sounds really interesting. I’m thinking about getting a pad or tablet. One thing I wonder about is if the magazine gets downloaded to my machine or if I need a wifi connection every time I want to look at it. If I get a pad or tablet, I don’t want to spend another $30 a month for a phone data connection and if I’m on the road I won’t always have a wifi connection. “Download app, click , pinch, and swipe”, to read a magazine! It’s not our grand mother’s world anymore is it. These days we say if your grandmother doesn’t recognize it as food it’s not edible. If my grandmother was alive today I wonder if she would be saying, ‘that’s not a magazine’ ! Thank you Mary for taking the mystery out of the new way to read and use patterns from a quality magazine. It doesn’t sound like one would lose any quality at all with the electronic magazine. Bravo country Bumpkins! Another item in the “pro” column is that you won’t have to build another room onto your house to hold all your magazines. And therefore, you can buy more magazines. Hi, Phyllis – it’s stored on your device (tablet, computer, what-have-you), so you can access it when you aren’t online. To make sure of this before I answered, I did turn off my wi-fi and close all applications. You just open the zinio app and click “read” and any magazine that you have downloaded is automatically there. You can manage your downloads, remove the ones you don’t want, etc. It looks like the publisher doesn’t run pictures across the gutter. I have read some art magazines in e format that do this and it is irritating to have the photo across 2 pages. For me, there are 2 additional pluses – storage and searching. I like to save magazines with patterns and I have a groaning bookcase. I also don’t have a quick way to find that cute pattern from a past issue on that bookcase that is now perfect for that new baby or other event. I tend to scan items from books/magazines and store them that way. Then I can pass the book/magazine to someone else and I still have the patterns I like but don’t have snivelling bookshelves. 🙂 You can sort the files in any way that you like, making them easier to find. When I saw in the Country Bumpkin newsletter that Inspirations would be publishing via Zinio, I did a little bit of research on Zinio. You can read the magazines on-line with a web browser, in addition to downloading them to your device, where you have to use the Zinio reader app. The download is in a proprietary format (not PDF). So, if at some point in the future, Zinio went away and the Zinio reader no longer worked, there would be no way to read the magazines. (Don’t think that this can’t happen — it already has with some e-book services.) Some people have had problems reading their magazines after 12 months, although the FAQ says that access never expires. The ability to print pages from the magazine varies from one publication to the next, so it may or may not be available with Inspirations. IMO, if you are buying a magazine to read once and then get rid of it, then this is probably a good medium for you. If you are buying a magazine to keep and read or look at again and again, then you’d be taking a risk that you won’t always be able to do that. So nice to learn about this. My favorite bookstore when I can get to it, no longer carries Inspiration so I could no longer buy the intermittent issues that I could afford and I hated to have to pay the huge price plus S&H to get a copy from those that sold them. Like others here, I too have groaning shelves and love to read actual magazines, but I miss the inspiration that this magazine gave me even though I don’t think I have ever made a project from it. It just has such wonderful techniques and I do have their book with all the different stitches that helps me immensely. Thank you so much for this Mary. I am attached at the hip to my Nexus 7, so I do all my reading of my magazines and books on it. I love snuggling in with a cuppa tea. Best thing is not having the heaviness of the mag. I have arthritis. Saves my hands for needlework. I really like the idea of being able to zoom in on photo details. Mary, thanks for this recommendation. I a big fan of online reading and already subscribe to a couple of publications I’ve been looking for an embroidery magazine of this quality and am delighted to find it. I often use my iPad as a small light box for transferring patterns so glad to hear I’m not alone in that. Hi Mary. I’m delighted that Inspirations is digital. I could no longer afford the paper subscription and I sorely missed it. This is such wonderful news. Your review helped me make up my mind. It’s really great having someone try everything out for us. 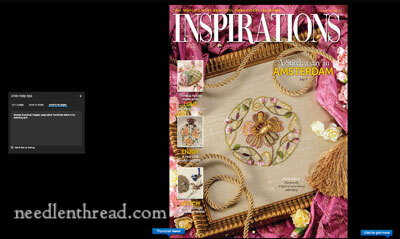 Thanks so much for letting us know that Inspiration magazine is now digital and much cheaper. I couldn’t afford to continue purchasing the magazine so it’s good to know that it is cheaper through digital I must explore this option. Talking of digital there are pros and cons I like to handle books/magazines and browse through them at leisure. But equally I also have digital books and it is a convenient way to store all those lovely articles on embroidery without taking up precious room space which I have little of and which could be filled with other needlework items. 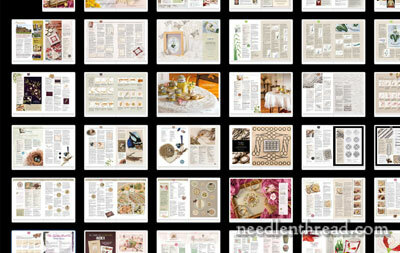 Thanks so much for the excellent presentation of the Inspirations digital magazine option. Since learning of this new option, I have been “on the fence” about buying a copy. You answered all my questions. I am so happy they decided to go with Zinio. Besides supporting so many different platforms, I can read the magazine on my iMac or my iPad which is something I can not do using Apple’s Newsstand. Now if the Needlepoint magazines would catch up, I would be in heaven! I’m still waffling on e-magazines. If they are PDFs (like the Threads archive is) I’d be more inclined to buy. I also pass magazines on to my Mom, or take to a book reseller. I’ve also gotten many magazines and books from that reseller, which wouldn’t happen with electronic versions. And another question I’ve never quite gotten an answer to – when those devices fill up, how do you save the bits that you still want and delete the rest? With PDF versions, I can print out the pages I want to keep (or refer to while working them) and then (gasp!) hit “delete”. Not only that, but I’m more inclined to go back and look at old paper versions than I am to look at old electronic versions. Out of sight, out of mind I guess. Hi, Gail – I back up my stuff on my computer and external drives. They don’t really take up that much space, so they’re always there. I know there’s concern about the question “if Zinio dies,” but I figure if I keep the app updated, even if the company does die and I’ve downloaded the magazines, then I can use the version of the app that’s on my computer to continue reading the magazines. In any case, yes, there are always stability and stay-ability issues in the ever-changing techno-world that we live in, but I suppose that’s the price we pay for the “convenience” (and discounted price) that comes with electronic versions. I’m still going with the print version, personally (for now, anyway), but I can see how people who like electronic versions would be very pleased with this version of Inspirations. I’m not much interested in e-magazines–I don’t like reading online when “relaxing” (I do it all day long at work). But I’m curious (and running out of space), so I have checked out several types of e-magazines, just to see. You said you can download and print the patterns. Can you also print pages of the magazine? I like to photocopy the materials or threads lists to take with me to the store. Most of the e-magazines I’ve seen are not printable. I would like to thank you for this information. 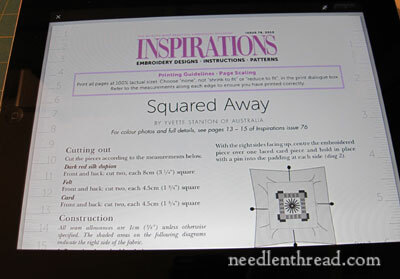 I wish more quilt/craft magazine would start producing more for the E-readers. Not only does it save floor space you can down load only the ones you want. I hate it when I get a magazine in the mail and wish it hadn’t come, because there is nothing of interest for me in it. I have to say I have bought several magazines on Zinio and I rather like it! I like that we aren’t wasting paper. I just downloaded and saved the patterns and won’t print them out until I actually need them. Saves paper and ink, saves having to file them, and they are super easy to find. I tried it when I was flying and that way I had reading material for the plane on my tablet. 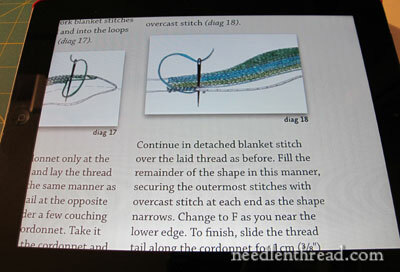 I love reading on my Kindle app even though I enjoy audio books while stitching or doing housework. Glad you gave it a try! Oh another plus is that digital is cheaper. I am not a Ludite and I have many “electronic” gadgets. But when it comes to books I am very definite. I just adore not just love but more passionate about being able to have a paper book, to smell it, the smell of the ink and paper has a most comforting sensation for me. To feel its silky pages in my hand and to be mesmerised by the beautiful colours of the contents. “It just ain’t the same” is a quote I like when it comes to books. Look in the book case and reminiss at the names displayed before you. A tad hard Mary to do with an electronic device. The device might get warm but it not like having a paper book lying on your chest when you fall asleep. Get what you want but make mine paper books please. Also in the Pro list I down load when traveling , so don’t have to wate to get home. Thanks for telling us about Inspirations being available in digital format. I’m definitely going to subscribe. (I have just had a computer glitch so I hope this is not a duplicate). I subscribe to the Embroiderers Guild “Stitch”. 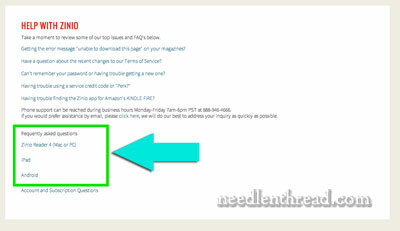 It was a choice of patterns as their other magazine, “Embroidery” is more article biased. This sounds good but still a little expensive in comparison, it would really need to wow for just four copies per annum. Next Next post: Embroider your Christmas Cards!